One application of a Pressure Controlled Heat Pipe (PCHP) is for extremely precise temperature control, when either the power or sink conditions vary over a wide range. Variable Conductance Heat Pipes (VCHPs)are often used for temperature sensitive electronics. The electronics temperature can be controlled to +/-2°C with an electric heater on the VCHP reservoir. By active control of the reservoir volume, milli-Kelvin temperature control can be achieved, with rapid response to changing conditions. 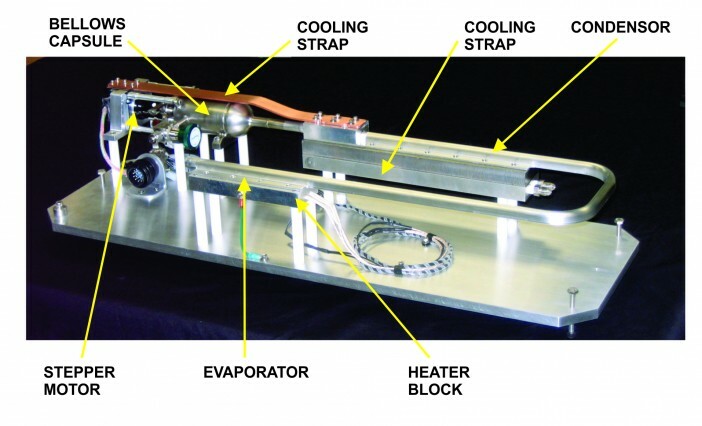 The operation of a bellows/piston type of PCHP for precise temperature control is shown in Figure 1. During operation, liquid vaporizes to cool the evaporator. The vapor travels to the condenser, then the condensate is returned by capillary forces. The non-condensable gas is pushed into the reservoir and the end of the condenser. At higher powers (or warmer sink conditions), the piston is withdrawn, so that most of the condenser is open. Less condenser area is required at lower powers, or colder sink conditions. In these cases, the piston pushes additional gas into the condenser, helping to maintain the heat pipe at a constant temperature. By using the electronics temperature to control the piston location, milli-kelvin temperature control can be reached, using the feedback loop shown in Figure 2. Figure 3 shows an aluminum/ammonia PCHP developed by ACT for precise temperature control. The heat pipe is bent so that it could fit in a specific vacuum test chamber. A heater block supplies heat to the evaporator, and a chill block is used to cool the condenser. The bellows capsule is the non-condensable gas reservoir. 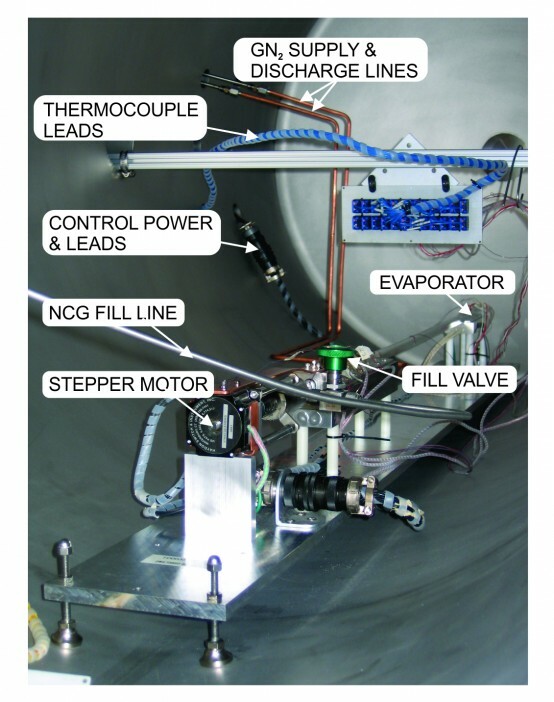 Figure 4 shows the PCHP mounted in a thermal vacuum chamber for testing. The PCHP had excellent temperature control during the thermal vacuum tests. Figure 5 compares the open loop and closed-loop response of the PCHP over variations of input power. This PCHP is able to maintain a steady evaporator temperature (measured by the RTD) over input powers ranging from 50 to 125 Watts. 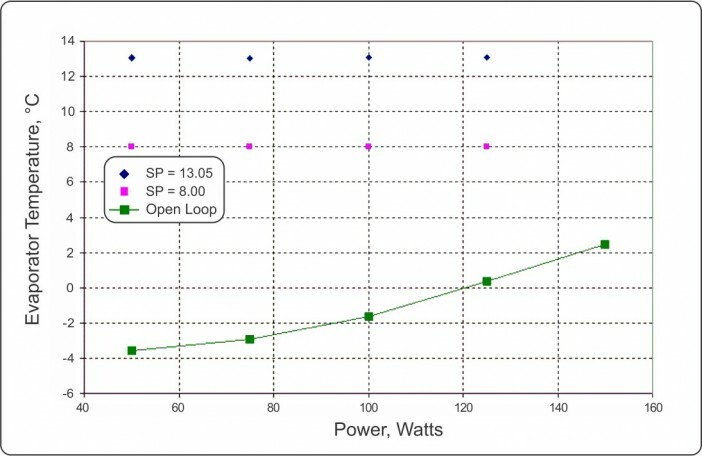 In the figures, Open Loop refers to the no control case, or behavior as a passive VCHP, and SP refers to the Set Point Temperature in closed loop mode.